Joanna James is a director, producer and writer based in Manhattan. 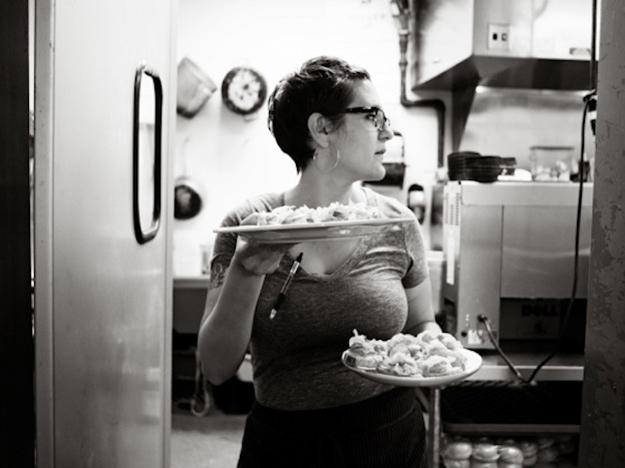 She is the filmmaker of the documentary A Fine Line, exploring why only 6 percent of head chefs and restaurant owners are women. The film is scheduled to release this spring. Follow its social media @AFineLineMovie for updates: Twitter, Facebook, or Instagram, or visit AFineLineMovie.com to inquire about hosting a film screening and speaking engagement from the filmmaker. . Growing up in the restaurant industry if a man even looked at me the wrong way I felt bad for him and the wrath that would follow. Sure, you could argue it was because I was the boss’s daughter, but I would argue it was because the boss was a woman. Honestly, she was probably yelling at me the most, since I was an overzealous teenager flirting with the line cooks, but she ran a tight ship with no excuses or time for child’s play. And she definitely didn't condone rude, aggressive or just plain degrading workplace sexual behavior coming from some of the most prominent male restaurateurs today. Nearly 30 years later, in a restaurant with more than 60 employees, my mother has never had one sexual harassment claim. That is a testament to her as a leader and the culture she created, but also the men she hired who respected their co-workers, themselves, and their jobs. That question is what I have been exploring for the past four years, making a feature-length documentary called A Fine Line which celebrates world-renowned women chefs who excelled in their craft and businesses. It includes my mother, Valerie James. It celebrates women who were on a mission to do what they loved, some while raising kids, and all with the odds stacked mightily high against them. Through this endeavor, interviewing chefs such as Dominique Crenn, Elena Arzak, Barbara Lynch, and Michael Anthony, as well as culinary advocates, deans of culinary schools, food media and central figures in the restaurant world, I’ve gathered perspectives as to what collectively can be done to propel sweeping change towards gender equality in the restaurant industry and beyond. The very first step, which sounds much easier than it actually is, is changing a false narrative. It's preventing misconceptions from perpetuating, whether that is something like "women shouldn’t be in the kitchen because of how physical it is" or that schedules are not conducive for working mothers. As I like to point out, the nursing industry is 90 percent women driven, and has all the same if not more grueling conditions. (Oh and interestingly enough even that mere 10 percent of men still make more than their female colleagues). No one can deny how demanding the job of a chef/restaurateur is between the long hours, constant responsibilities, difficult margins and stress, let alone the physicality of the job, but that has no bearing on whether it is a woman or man deciding to take that on. If anything, women probably have it a bit harder since they have to constantly prove they not only can do the job, but have to do it much better just to be considered equal. Operating on the notion that restaurant environments can change from men and women seeing past their differences—maybe even embracing those differences—this shift needs to translate into hiring practices that extend to women. Especially important is for more mentorship and apprenticeship opportunities for women in fine dining and highly-regarded kitchens and restaurants. Out of 72 Michelin-starred restaurants in New York, only six are run by women. So yes, it is time for these establishments to put actual effort into promoting diversity and inclusiveness, and one way could be reaching out to organizations like Women Chefs and Restaurateurs and other leading women groups that could play this connector role. And the larger, more honest question here is: When is the restaurant industry going to evolve and realize that many of the same obstacles holding women back, in fact make it just as hard for men to lead normal lives and get ahead in the industry? The truth is that many of the restaurateurs I spoke with admitted there was a scarcity of culinary talent coming through their doors looking for work. So the larger conversation is not just about exploiting women and sexual harassment in the workplace, but reforming an out-of-touch industry from oppressive and unrealistic working conditions that affect both men and women alike. This is where the most systematic changes are needed in the restaurant industry to actually make a difference: paid parental leave, flexible scheduling/pay structure, and resources/support. Paid parental leave affects both mothers and fathers, but the overwhelming truth is that it would significantly increase the representation of more women in leadership positions, especially in the restaurant industry. When women are not valued enough to be allowed even minimal paid-time off from work after giving birth, or worst let go or fired (which in many cases continues to happen) upon their return into the workforce, they have to constantly play catch-up rather than advancing in their career. This not only creates a reversal in credentials and income, but also causes more women to leave the restaurant workforce, or just not enter it in the first place. More common sense practices are needed, which some visionaries in the field have instituted. The monumental infrastructural change Union Square Hospitality Group implemented to its front and back-of-house pay model under Danny Meyer will have resounding effects for the kitchen staff to be paid more equitably, and helps both men and women alike. If some similar transparent pay system is introduced into family-style restaurants or lower-paying dining rooms, servers (who are predominantly women in this sector) across the country will also have the chance to make above the poverty line rather than continue to only make $2.13 an hour. With Barbara Lynch Gruppo, the acclaimed Boston restaurateur has instituted some basic ways to prevent employee turnover, that for some reason come across as rocket science. These include things like hiring more sous chefs, allowing for shift rotation, and splitting up the hours. This flexible scheduling helps keep older employees—many of whom have families—on the staff. Ultimately, to get more women promoted or make the leap into ownership, more resources must become accessible. Especially for women to take the lead in this, supporting one another to get ahead rather than having tunnel vision for their own self-interests. As Susan Ungaro, former President of the James Beard Foundation and champion of women's advancement, said: “We need a good old girls club” in the form of a network of professional women in different career paths who collectively can help each other do better. This community can make it so that it’s not next to impossible for a woman to get access to capital, media coverage, or a good contractor. We need to nurture and foster culinary and entrepreneurial talent in women and men, or else one of the most important job sectors in this country will become overridden with large chains and gross food. Restaurant workers and employers are getting burnt out, and that is not just from dealing with exploitative, bad behavior, but rather a lack of support in all aspects of the business. I consider myself so lucky to have grown up in the restaurant industry watching and learning crucial life lessons from the greatest boss/role model—a strong, smart, compassionate woman—who happens to be my mom.